Since 2001, we are developing research studies on synthesis of aligned carbon nanotubes by aerosol-assisted CCVD. This method is based on the catalytic decomposition of liquid carbonaceous sources and involves the simultaneous and continuous feeding of the reactor with the carbonaceous source and the metal catalyst precursor. Nanotubes produced by this process are aligned and contain almost no by-product ; their length can be controlled in a wide range. The aim of our studies is to control this process in order to get aligned nanotubes with physico-chemical characteristics adjusted to various applications. 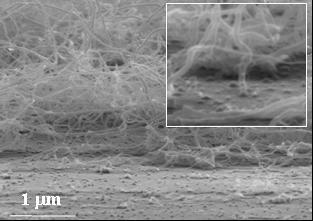 Therefore, we are studying the effects of synthesis conditions on nanotube characteristics. In addition, we are performing studies on the determination and understanding of growth mechanisms of aligned carbon nanotubes. Regarding potential applications of such nanotubes, our motivation is first to demonstrate the ability of this process to be scaled up. The potential applications that we are developing in collaboration with different teams are based both on the alignment and on the length of nanotubes. For instance, we are working on nanoporous membranes useful in various fields (environment, biology,…), or on the adjunction of such nanotubes in different materials in order to make them electrically or thermally conductive. Nanotubes aligned perpendicularly to a silicon substrate, such as a carpet.